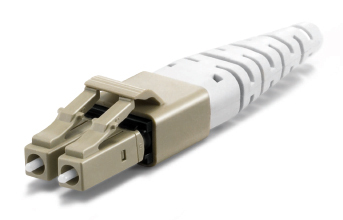 There are five commonly used single-core connectors for office and outdoor applications. Three of them (FC, SC, and LC) also come with the angled varieties, making the total number of choices eight. 8� angle are sometimes necessary to reduce surface reflection (<-60 dB) for some singlemode systems. For most applications (SM or MM systems), however, standard 0� versions (ST, FC, SC, and LC) are more than adequate for reflection performance (<-40 dB). One needs to consult with media converter vendors to determine if angle is necessary. Keep in mind that angled connectors have higher loss than their non-angled counterparts. "PC" stands for "physical contact" while "APC" stands for "angled physical contact". In both cases, the connector surfaces are shaped like a dome with the apex perfectly centered at the fiber core. So when connected, the mating fiber cores are in perfect contact eliminating the air gap entirely. Therefore, index matching gel is not necessary for either PC or APC type of connectors. Contact with inert liquids such as petroleum based oils won't have any adverse effect on the performance of the connectors. However, water should not come in contact with fiber surfaces over extended period. FC, SC, LC, and ST all have very similar optical performance. So form and housing material factors are often the main consideration when choosing a connector type. ST is the most popular for field applications for both SM and MM fibers. FC is the distant second. They are both made out of metal (zirconia ferrules) and have similar body diameter. However, ST latches on to the mating sleeve while FC screws on. Princetel also carries the MIL SPEC ST connector with all stainless steel construction. SC and LC (both push and pull) are often chosen for tight space where twisting with fingers is difficult or impossible. They can both be used in pairs in duplex applications. SMA connectors are almost strictly used for specialty fibers that have larger diameters. It's optical performance is the worst among all the above alternatives (highest insertion loss and lowest return loss). Note that the SMA connector ferrules are flat and made of zirconia for 125 um fiber and metal for all other size fibers. Unlike the higher performance connectors, SMA mating sleeves do not include zirconia split sleeves, key components to keep loss low. Princetel stocks all the above mentioned connectors for SM, MM, and PM fibers and perform termination operation in house using Princetel brand polishing machines. All angled connectors have identical constructions, materials, and dimensions as their non-angled counterparts. Green colored strain-relief boots are reserved for APC type of connectors. Since ST, FC, and SC share the same size ferrule (2.50 mm diameter), they can mate with each other through hybrid adapters (ST-FC, ST-SC, FC-SC). Do not use adapters with metal sleeves. Zirconia sleeve based adapters are critical for most applications especially when singlemode fibers are involved.